18 February, 2018, The Sleuth of Baker Street Book Shop. Already three things had gone just right. The bookmarks that had been printed on the wrong paper were replaced in time for the book launch. The traffic was good going into to Toronto and I didn't get lost, so I was early for a change. My niece Sophie and her partner Eric arrived at the same time. They decided to go for a walk and brought me back coffee. It was a great start to a great day. Joan O'Callaghan, Deadly Dame and Baker Extrordinaire, was setting up when I arrived. Joan baked the Cat Cookies for The B-Team, and Salted Caramel iced cupcakes for Ghost Writer. For Survival of the Fritters, Von Doughnuts produced a beautiful selection, including the donuts on the cover. Nothing is ever perfect, of course. Janet Bolton, aka Ginger Bolton, was sick with the flu. Cathy Astolfo, who was going to stand in for Ginger/Janet had a family emergency. Fortunately, our Deadly Dame Designated Reader Nancy O'Neill became Ginger/Janet/Cathy/Nancy for the book launch. The place was packed when Joan (also our illustrious emcee) started the presentation. In addition to my niece and nephew-in-law, I was blessed with the presense of my Uncle Denis and cousins Lesley, Hilary and Amanda. By happy coincidence they were all together for the Family Day weekend. 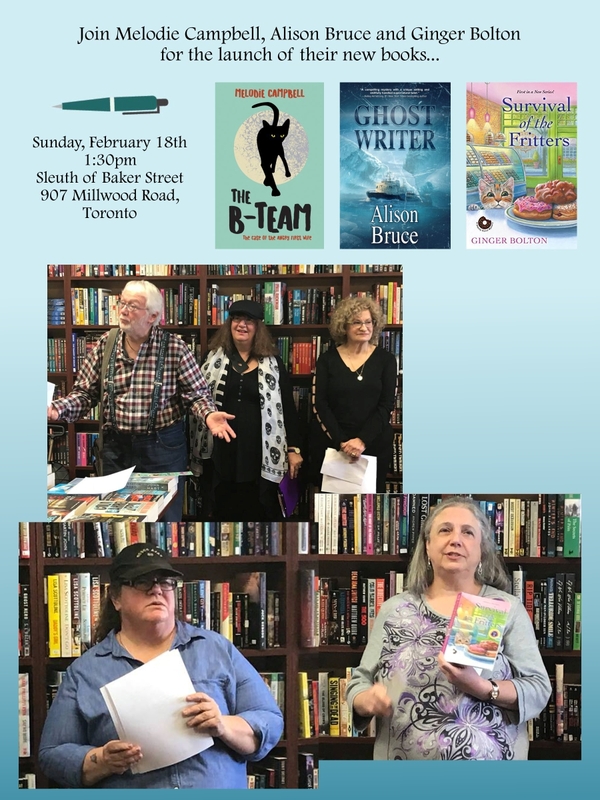 Another highlight was having Don Graves, past reviewer of the Hamilton Spectator and now reviewing for The Bay Observer, read his reviews of The B-Team and Ghost Writer (see below). It was a great lead in to our readings. All in all it was a perfect day. I saw some old friends and met some new ones. We sold lots of books and had a great time. Big thanks to Marian Misters of Sleuth of Baker Street (907 Millwood Rd, Toronto) for hosting the events and having such a great bookstore for events like this. Thanks also to Orca Book Publishers for promoting Survival of the Fritters and Ghost Writer as well as their book The B-Team. Hugs and thanks to Joan and Nancy for their help and support. It was truly a launch to remember. As a reviewer, it’s important to be upfront. So, I confess to not being a big fan of romances and ghost stories. But— and this is a big but—when an author blends romance and mystery with ghosts to produce a story that kept me reading, then I call Ghost Writer a compelling winner on all fronts and I’m waiting for more from protagonist, Jen Kirby. 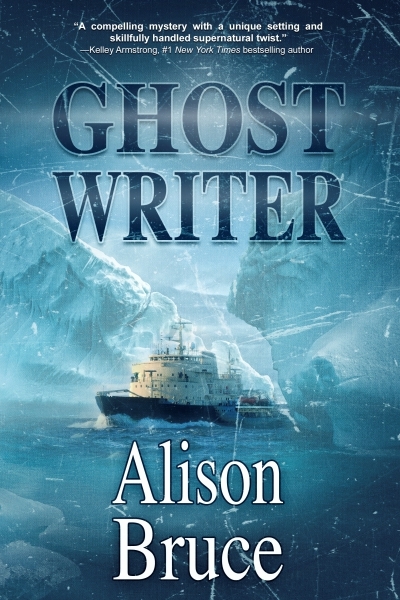 The characters are strong and author, Alison Bruce creates a driving story with humour, action and, not to forget the ghosts who won me over with honest reflection and a poignancy that led me further into the plot. The climax ties it together, a challenging task when you’re in the Canadian Arctic with a crew trying to solve a forty year old mystery involving a foreign submarine station and someone determined to keep the mastery unsolved and keep Jen Kirby, the onboard writer, alive to tell the tale. Ghost Writer is a 5 star read. Don Graves. Canadian Mystery Reviews. 5 stars. Click here for Don's review of The B-Team. Congratulations to all of my dear Deadly friends! Wish I could have been with you on this illustrious day. I'm very happy that everything went well, not that I am surprised by the success of the baked goodies, or the tech whiz stuff like bookmarks, and the great reviews. I am so honoured to (normally) be a part of this critique group/authors/reader-travelers. It's such a gift when I love the people but also love their writing. That doesn't always happen. Lucky me! We missed you, but you were with us in spirit. In fact, I'm pretty sure a cookie or two got spirited away. Was the you? It was a great afternoon and I am so happy I could contribute to this event and honour friends (and fellow Deadlies) Melodie, Alison and Janet aka Ginger!